Our week in Cuenca had somewhat of a holiday 'feel', but managing to buy a car? No. And managing to sell our car? No. We looked at the historic centre of town and other things worth seeing. And we saw A LOT of cars. Really. But not one that we saw fit to buy. And the carsalesmen here haven't got the money to exhange your car with another, when your car has over-value. So that wasn't going to work either. There seemed to be only one thing to it; go travelling with our own car and sell it after. It is a good, comfortable, big car. So if it would last through the holiday in a good state, we could still sell it. Eric decided to let some necessery work be done on the car, to make sure it would hold well through the travelling. The transmission fluids needed to be changed (overdue) and he had felt the steering wheel to move more then it should. 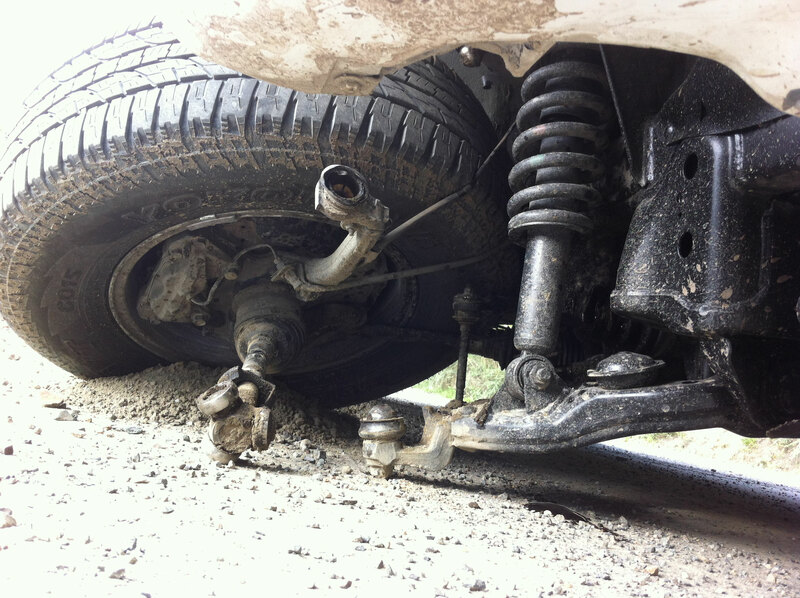 So he was going to make an appointment for this in Quito, with the guy who had fixed the car in the first place. We weren't entirely sure whether we should write the 'lost' week in Cuenca off as being 'bad luck'. During the week we had moments where it sure felt like it, but overall it seemed an 'ok' week where we met nice people and found edible cheese(!!). We might be really spoiled by life in general, because for us it is unusual not to succeed, even it would have been last minute. So on the morning we had to decide we should go back home or book another night, we were secretely still presuming something would come up and we would go home with another car. It made us feel a bit insecure to have to throw the towel in the ring and drive home in the Toyota. Did we do something wrong? Did we make a wrong decision somewhere? And when we got home, the next morning it suddenly felt totally ok to travel with the Toyota and the whole issue seemed solved and really even a non-issue. Which made me wonder (not for the first time) where these feelings come from and why we suddenly felt this way, both of us. Out of the blue, at the approximately the same time, without having communicated it. When I was a teenager I first started wondering how these things worked. I'd wake up one morning with a bad mood and not seemingly able to help myself change this. And then, just as easily and out of the blue, I would feel fine again?!? I like to decide on this subject that I make my own life, but the fact is; I have no idea where these feelings come from and how they take hold of me. And when they are nice feelings I usually don't really care, but when they are unpleasant, I meditate and look at them. And there are times where I can see what I thought (because it usually starts with thinking something) that gave them a ground to exist in me. But this time I couldn't. And in these times it feels like I might be a puppet on a string, living in an illusion, with the idea or belief of having free choice in these matters. Sorry, I sidetracked, back to the run of bad luck. O wait: first a tiny bit of good luck in between: on Sunday the landlord with his family hopped by and told us they will take over all the wood, cables and pipes that we put into the house and they will pay for it. So when we leave we can leave it here and we get some compensation for it. When we were back home from Cuenca, JF let us know that Eric needed to come with him to Loja -to see a lawyer- someday soon, to finish the buying of the land. The sale was now somewhere between being ours and being theirs. It was no-ones land at the moment. Only half of the money was paid and a flimsy contract was signed at a notary, but it was not finished. A little hurdle that needed to be taken. So we went to Loja last Tuesday to sort this out, do some shopping and ask about the driver's licence again. Because we hadn't been able to make an online appointment for the theory exam: we didn't seem to fit in any of the category's to choose from. At the lawyer it appeared that another 1000 dollars (next to the 2000 dollars we still had to pay) had to be invested to fulfill a lot of council regulations. That was a setback. At the driver's licence facility it appeared that we could not do it the way we had creatively thought it out. If we didn't have the necessery paperwork from the Netherlands, we had to start as a beginner. Which meant compulsary theory AND driver's lessons for a minimum of 2 weeks and the ability to speak and write good Spanish... Another setback. Creativity doesn't work here. Smiling friendly didn't convince them we spoke fluent Spanish either. Bummer. On the way back home we considered our options. Nikki's idea was to let the land 'just sit' for a while and do nothing. let the sellers do something in the direction of helping us a bit. She thought we could postpone it that way. And if nothing would ever happen, we would have 'only' lost a 1000 dollars each, since that was all we had paid so far. Considering the driver's licence; we decided to put the work in and get the paperwork in the Netherlands appostilled and sorted. This means we would be driving without a proper driver's licence for a while. Pfff. Was that where the setbacks stopped? No. Yesterday was a ridiculous day. It was 'the king of all setbacks'-day. Really. Eric calls it 'The Bad Luck Day'. When I woke up, Eric had just started doing some book keeping, so that we might be able to finish the whole tax stuff off in the Netherlands for last year. For this he needed to access a bank account that only works through putting in sms data. So he opened the page, quickly got in the car, drove 2 km's to a spot with (hopefully) some phone reception and waited there for the sms to come in. Tried it again, together this time (so I could fulfill the important job of holding the phone out the window in the hope it would connect to reception this way) and drove 5 km's. Nothing. We decided to try the other side of Yangana, where the hills were higher: So maybe we would find a pocket of reception there. We knew the online session had expired, but decided to check if there was any reception first, before starting another online bank session. Disappointed and not in a great mood, we drove back down the hill when suddenly the right front wheel of the car broke off without any warning and we were stranded. We were lucky not to be near the edge, in a curve or driving fast. When we got out and saw what had happened, we couldn't grasp it at first. How could the wheel just break off? How much would this cost to fix? How would we get home? Could we still travel? Why did this happen? We had just gotten in the car with our 'home clothes' (jogging pants, etc) and no other things with us. There was no reception and even if there would be; we only had our Dutch prepaid sim cards with us. While we were discussing what to do, a truck came by. I put my hand up and he stopped. I have to say; Ecuadorians are VERY friendly. Really. Genuinely. The guy came out and looked at the situation. He got on his knees and looked under the car. After his personal assessment he decided, just like us, that we needed to get a towtruck to bring us to a garage. He offered to do this for us, or take us to a phone, whatever we prefered. We decided to empty the car of valuables, put the alarmlights on and drive with him to Yangana, to Nikki and JF, so JF could help us call a towtruck (his Spanish is pretty good). Side setback; I remember seeing Eric take his phone out of the car and put it in his pocket. I specifically recall this, because I had my phone in my hand and no pockets to put it in. So I was very aware of my own phone and therefore aware of his phone as well. What happened with it after, we don't know. When the truckdriver let us off, we still had a 2 km walk to Nikki and JF's place to do. They live remote, not accessible by car. Off course they were not home (when you have bad luck, you have bad luck). When we had searched the land and called them for a while, we decided to walk back. On the way back we bumped into Neil, their youngest son. He said he could help us reach them. So we walked back with him again. He tried to call them by satellite phone and through whatsapp. The wifi appeared not to work ( off course) and the satellite phonecall was not answered. After trying this for some time, we decided to walk back to town again. On the way back we bumped into Nikki this time. She said she would get the wifi going and could reach JF (who was in Vilcabamba). Long story shortened; there remained to be no wifi, we had a lot of exercise walking up and down and nothing worked. However: Nikki gave us the keys to the car they were allowed to use for small distances (from the owner of the house where they stayed) and we drove home. Beer, who had seen us leave 2 hours before, had just started getting worried about us. Eric (still in a bad mood) decided he wanted to get back to the car soon, because he was afraid his phone might still be in there and get stolen while the car was abandoned. He was determined somehow to get help somewhere and get things sorted. It was 13 o'clock. I saw him shortly at 17.30 and then again at 23.30, at which time it was all sorted out. Wow. He had started of by checking the car and realized his phone was not there. 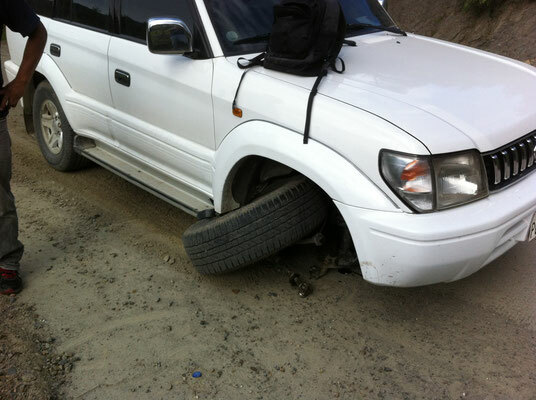 After this he went into the police station in Yangana and got the officer to help him to call a towtruck. The officer also had no phone connection and no credit on his phone and was not allowed to use the satellite phone at the station for anything other then dire emergencies. So he contacted his wife through whatsapp, after driving to a place with connection. His wife got a towtruck company to call him. 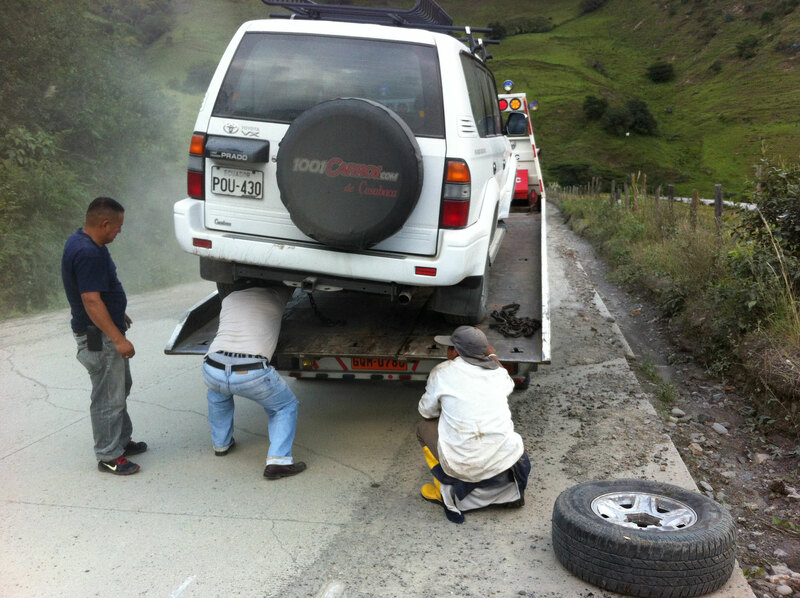 The nearest towtruck company was in Loja and took 2 hours to get there. In the mean time Eric ran into Edwin (the cabdriver annex handyman who helped us with the house). 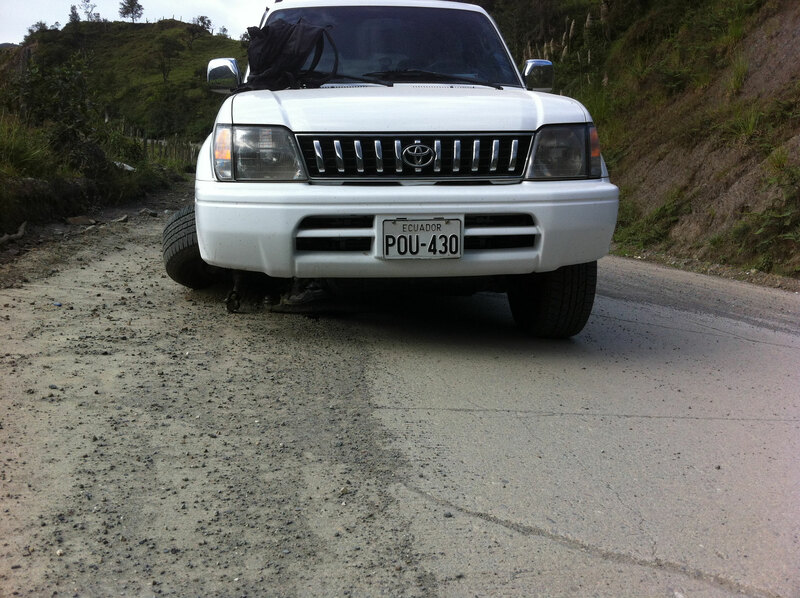 Edwin went to Loja with Eric and with the towtruck to get everything sorted there. He advised him to use a garage that some of the cab drivers use, which was a cheap and effective garage. This would save him more then 2000 dollars (which is what the Toyota garage would charge). After the car was safely in the garage at 20.30 at night, Edwin and Eric went for a bite together and returned by cab later. To experience endurance? To teach me that all the petty problems I have are trivial? To make me laugh about how much we rely on mobile phones but without reception they're worth NOTHING? But apparently a phone is very worthwhile to a thief. Someone must have picked it out of your pocket, Eric? Boy, are you guys pioneers!! Tegenslag maakt mij weerbaarder. Ik kan dan ook weer intens gelukkig worden van iets heel simpels. Jullie hebben elkaar, dat is geweldig.